Preface (T. Zakar). Late Pregnancy and Parturition in the Sheep (W.J. McLaren, I.R. Young, and G.E. Rice). Regulation of Oviposition (F. Herelendy, K. Shimada, M. Toth, M. Molnar, and K. Tanaka). Initiation of Parturition in Non-Human Primates (J.J. Hirst and G.D. Thorburn). The Physiology of Human Parturition (J.E. Mijovic and D.M. Olson). The Trophoblast as an Active Regulator of the Pregnancy Environment in Health and Disease: an Emerging Concept (D.W. Morrish, J. Dakour, and H. Li). The Endocrinology of late Pregnancy and Parturition (T. Zakar and B.F. Mitchell). Steroid Modulation of Myometrial Structure and Function during Pregnancy (C.A. Ducsay and J.W. Rhee). Determinants of Reproductive Mortality and Preterm Childbirth (J.A. McCosen, P.A. Fernandes, M.L. Borditsky, and J.G. Allardice). One of the mysteries of mammalian reproduction is the physiologic process that determines the length of gestation. The proper timing of birth ensures that the young individual is sufficiently developed to survive and adapt in the extrauterine environment, and that the mother is capable to provide nutrition and protection to the newborn. This volume summarizes new knowledge obtained by many researchers seeking to unravel the compile mechanisms that contribute to the maintenance and termination of pregnancy. The most important common goal of these efforts is to reduce the incidence of preterm birth, which is the leading cause of perinatal morbidity and mortality in numerous countries. 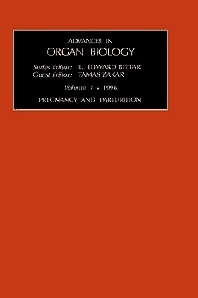 Separate chapters are devoted to the best-studied animal models of parturition. In sheep, the fetus is in control of the timing of its own birth, while in avian species, oviposition is evidently determined by the female laying the feritlized egg. In humans and non-human primates, the roles of the fetus and the mother are more balanced, and involve a complicated and poorly understood interplay between the mother, the fetus, and the placenta. Some major aspects of these interactions, such as trophoblast function, myometrial contractility, and the endocrine-paracrine systems, are discussed in further chapters.